Readers have cherished “A Wrinkle in Time” by Madeline L’Engle for decades since its release in 1962. It was groundbreaking at the time for attempting a sci-fi, fantasy story for young readers much like we’ve grown accustomed to in recent years with the increased attention to the YA formula. It’s now been given the big screen treatment thanks to Disney and Selma director Ava DuVernay. Fourteen-year-old Meg (Reid) and her younger brother Charles Wallace (McCabe) are outcasts at school. The other students hurl hurtful language at them claiming that “crazy runs in the family.” Their parents are both scientists, but their father, played by Chris Pine, has gotten a bit too lost in his work to the point of going missing. It’s the four-year anniversary of his disappearance, so Meg and Charles Wallace are the targets of more negative attention at school. It’s at this time when three mysterious celestial beings, Mrs. Which (Winfrey), Mrs. Who (Kaling), and Mrs. Whatsit (Witherspoon) visit them in hopes of helping them find their father. Meg is apprehensive but Charles Wallace has already spent time getting to know them. Along with their friend Calvin (Miller), the siblings place their trust in the three Mrs. W’s and use a tesseract to bend time and space for an adventure into the unknown in hopes of reconnecting with their father. To further complicate matters, the three children are introduced to a force known as the “It”, which is a dark force taking over the universe. There’s a lot riding on this film given the devotion people have toward the book. It will naturally draw ire from people claiming it’s different than the book or that the characters aren’t how they envisioned while reading it. My vision for these characters while reading the book could be very different than the author’s. The same could be said for DuVernay and her crew in how they decided to bring them to life. It’s worth a reminder that there really is no wrong way here. For a story like A Wrinkle in Time set in a far off universe, anything is possible and it’s vital for moviegoers to remember that. DuVernay keeps it tangible for a younger audience by placing it in a contemporary society. She rightfully utilizes a multi-racial cast, which speaks to the diversity that would be found at a modern high school. This is also played out with the casting of the three Mrs. W’s with Reese Witherspoon, Mindy Kaling, and Oprah Winfrey. As Mrs. Whatsit, Witherspoon brings out the bubbly similar to her Legally Blonde character, Elle Woods. DuVernay cast her friend Oprah Winfrey as the all-knowing and wise Mrs. Which. Of course you cast Winfrey in the deity type of role. She barely needs to act as the role feels catered to her. This time her words of wisdom need to fit a younger demographic than she’s used to when she’s being Queen O. Of the three, Mindy Kaling is stretching a bit outside her comfort zone. The only problem is that she’s a bit stilted by the fact she only speaks in quotes. Screenwriters Jennifer Lee (Frozen) and Jeffrey Stockwell (Bridge to Terabithia) give her current pop culture references from Chris Tucker to Lin-Manuel Miranda as well as the old greats like Shakespeare and Gandhi. Not every quote lands like it should and it takes a sharply in tune moviegoer to catch every one. I hate to admit that the three Mrs. W characters are the weakest parts of the movie. I don’t think the script has a clear enough vision of how to use them effectively. They are given elaborate costumes more so used for show to grab the audience’s attention as opposed to making a distinct cohesive style choice to fit the needs of each scene. They’re enhanced at times with unnecessary CGI, which is horribly apparent with Winfrey’s first scene. The three Mrs. W’s are primarily used in the first half leaving the film to feel disjointed and unable to find it’s footing for a lengthy period of time. It only starts to pick up when time starts to diminish, and the kids are forced to be on their own to find their dad. None of this will really matter for the film’s target audience. This is a big-budget Disney movie after all. It feels like a mix of The Wizard of Oz and The NeverEnding Story and is visually appealing with the variety of color palettes and textures on display with every dimension the kids visit. It’s worth noting for parents that the climax has moments of intense peril as the “It” starts to take over. It’s appropriate for kids seven and up or those who have watched the Harry Potter movies. Any kid who feels misunderstood or has dealt with bullying will relate to Meg and Charles Wallace. Young kids will want to get wrapped up in their adventure wondering what creatures and worlds will pop up next. DuVernay wisely keeps this demographic at the forefront at all times, which is the important part to keep in mind. I think it will give kids a sense of hope and self-confidence. The messages come through loud and clear even if there are larger problematic design choices that get in the way of it being a truly wonderful experience for everyone involved. 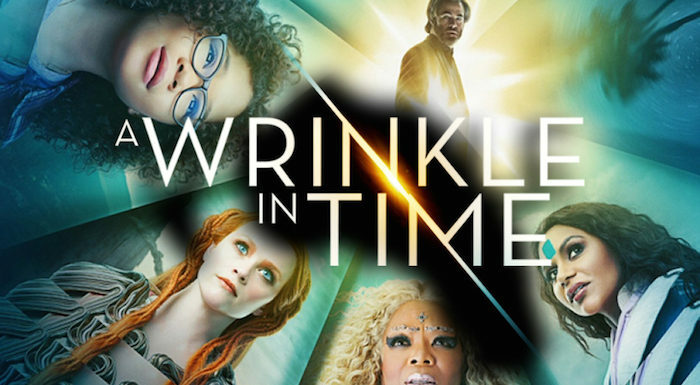 I would venture to say that A Wrinkle in Time could become a long-lasting, beloved family film to be cherished for years. It will hopefully be a source of inspiration to kids and a possible teaching tool for their parents to show how love and hope can conquer over fear, rage, and violence. Isn’t that just what we need right now? Is It Worth Your Trip to the Movies? Even if it doesn’t quite live up to the star power, the visuals and lessons are what’s important for its target audience.